First Line: It was over in less than three minutes. After her favorite uncle's death, police sketch artist Rory McCain discovers that there was much more to the man than met the eye. Rory inherited his private detective business and decided to contact everyone on his client list to settle all the accounts. 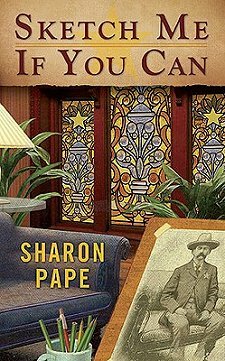 However, when she moved into his beautiful old Victorian house, she discovered that Uncle Mac had a business partner-- a federal marshall named Ezekiel (Zeke) Drummond. Trouble is, Zeke was a marshall back in the Arizona Territory in the 1870s, and he had the misfortune to be murdered in Uncle Mac's... make that Rory's... house on Long Island. Zeke's not going anywhere until he finds his killer either. Rory's still trying to decide if she's lost all her marbles when she's drawn into one of Uncle Mac's unsolved cases. As she's drawn in deeper, she realizes that she needs the help of an experienced investigator. Zeke applies for the position, but Rory's having none of that-- until a killer on the loose changes her mind. Rory McCain is a very impulsive and very stubborn character. Zeke Drummond may be old-fashioned, cantankerous and sexist, but he also has a good sense of humor and has a steadying influence on her. Pape gives us just enough of Zeke's story to get us hooked and looking forward to more. There's a heaping helping of humor in Sketch Me If You Can, and I found myself smiling and laughing out loud several times, as when Rory is confronted with her ghostly housemate and wonders why there aren't books like Living With a Ghost for Dummies or Chicken Soup for the Haunted House Owner. My favorite scene, however, was when Rory asked her parents and her aunt to help her investigate the scene of the crime. I hope she asks them for help again because they made quite the team! Although it wasn't difficult to deduce the killer's identity, and I felt the cast of secondary characters outside of Rory's family needed a bit of fleshing out, I found Sketch Me If You Can to be very entertaining, and I'm looking forward to the next book in the series. Sketch Me If You Can at Amazon. Sketch Me If You Can at The Book Depository. Sketch Me If You Can at Your Favorite Indie. This does sound very entertaining. Just the thing when I need a light read. Barbara-- Yes. It's perfect light reading!